These products are part of the acclaimed Master Accessories line. Each product features a small monster’s lair, usually three or four rooms, that can be easily added to your ongoing campaign. 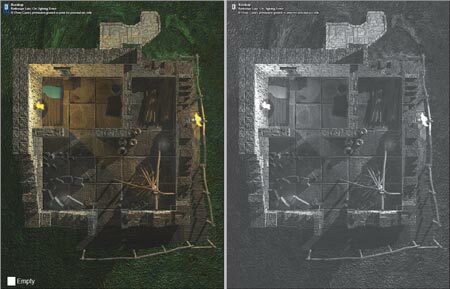 For each product, you get a wonderful overview map and three or four battlemaps for miniature games, detailing each room of the lair. 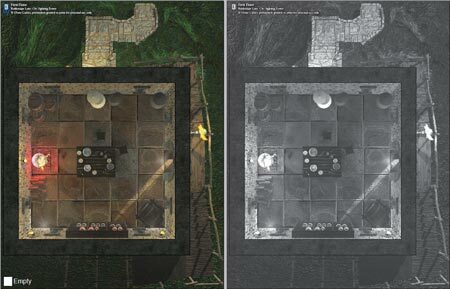 The battlemaps are superb 3d renderings at the stunning resolution of 150 dpi, which allows you to obtain an amazing print quality. For each map, you get also a grayscale-optimized version. In addition, Battlemaps Lairs offer you a degree of customization. At the bottom of each color map you will find a checkbox (that will not be printed) that allows you to make the room “empty”. Thus, if you do not need that pyre on the rooftop (perhaps because it doesn’t fit in your story) you can easily remove it. Battlemaps Lairs feature also a complete, ready-to-use D20 villain. You will find a complete statblock plus a background story that will help you create adventures and scenarios, and finally a combat tactics section. 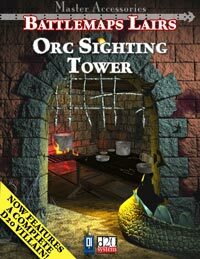 The Villain of the orc sighting tower has been written by veteran Tim Hitchcock. Wedged strategically in along the edge of the foothills, the roofless ruins of the lone signal tower stretch upwards. Even while the remains of its rickety woodwork clatter in the breeze, it stone sections continue to stand with a stoic resolve. Yet, even as they creak, you hear faint rustling noises from within as a dark shadow darts away from the window. • A smalltime gnome clockmaker seeks to hire a group of adventurers to recover some small but complex devices he calls spring-traps that he claims were stolen from him by a no good half-orc thief who used to be his apprentice. 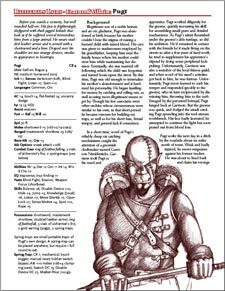 He claims the half-orc has fallen in with a gang of bandits that live in the ruins in the foothills to the north and is using the devices to ensnare travelers coming down the trade-road. He is afraid authorities will eventually recognize his craftsmanship and tying him to the crimes. The truth is that the traps bear the secret mark of the local thieves’ guild, and should the authorities find them in his ex-ward’s possession, they could be used to incriminate him as a high-ranking guild member. • The once disorganized and barbaric orcs of Last Hope have recently banded together under the leadership and organization of a half-orc named Pugt. The orcs believe he is a messiah, and he himself does little to assuage such statements. He has brought them great success with his clever tactics and use of guerilla warfare and traps. His forces are slowly but surely sweeping across the wilds and drawing ever nearer the borders of the civilized lands. Adventurers are summoned to stop the advance by making a covert strike against Pugt, circling the troops and coming up from behind to catch him in his tower. • The tower rests at the edge of some wind-stripped hills near an older trade route. The 50-feet square massive towers stand three stories-tall and were once used as military guard posts and way stations during the last war. A cracked stone stair climbs to a wooden door opening to the ground floor. Here is the remains of a forgotten armory. From there, a rickety wooden stair twists around the perimeter of the tower to the first floor, a former common room that still holds several large barrels, storage containers for food, and a large dining table. It has recently been converted to serve as bedchamber with kitchen. The rooftop level is badly damaged, the majority of it open to the elements, while a leaky roof covers a smaller room filled with more barrels. The open section has a large unlit signal-fire and nearby casks of oil that can be used to ignite it in a moment’s notice.